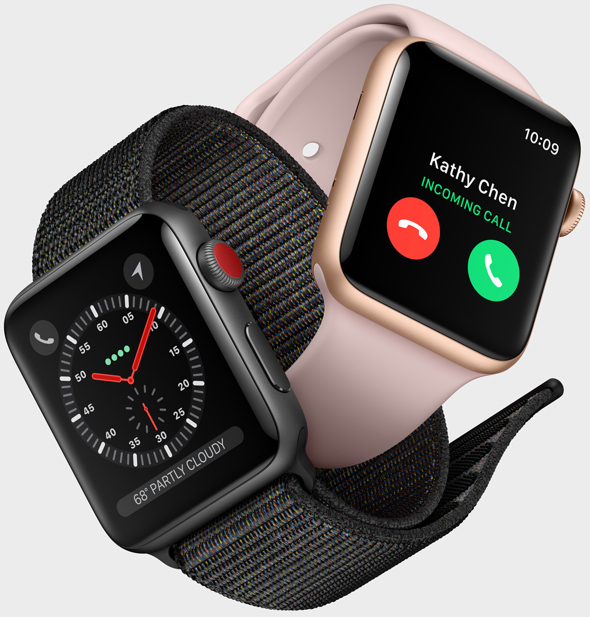 Apple Watch Series 3 (GPS + Cellular). The freedom to go with just your Apple Watch. People still make phone calls? So I’m not interested in the Watch, because I don’t take my phone with me when I run or swim or other kinds of exercise, and don’t especially want to, no matter how small it is. As I’ve said before, it has always struck me as a very expensive wrist-remote for the phone. It’s areas of clear usefulness definitely fall (so far) squarely in the jogging/swimming arena, and that does seem to be where Apple is marketing it with their commercials. So what’s up with the people walking around all day with the thing on their wrist? Am I to believe all these people are going jogging today? And if so, couldn’t they just keep it in their gym bag with their other jogging gear? I’m so confused by this product & its market. I can understand being curious & having money to burn, but I can’t see re-investing. You said, to yourself, when you looked in the mirror. The iWatch is great. It works very well as a phone, has increased my exercise, and keeps me up to date besides giving me the time beautifully. And I don’t regard the iWatch as anything less, than smart looking and modern.